There is nothing quite like sipping on a cup of afternoon tea, with a fair number of bites on the side such as sandwiches, a couple of scones with strawberry preserve and cream, and butter cookies to boot. When it comes to infusing the kind of tea of your choice, there are two ways of going about it. One, you can always take the boring, traditional method, while the other would alleviate the mood around the table even more. I am referring to the $11.99 Shark Tea Infuser, where all you need to do is fill the “shark” up with loose tea leaves, while letting it bite onto the side of your tea cup. Once that is done, just sit tight and wait for the tea to steep, and you’re good to go. 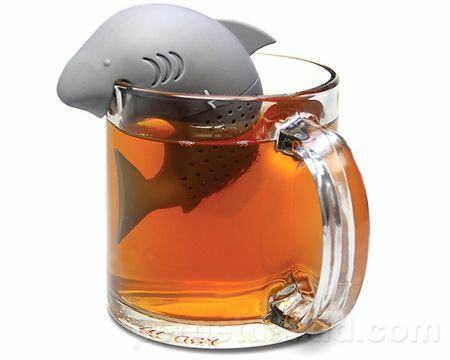 You can choose from blue or gray shades for the Shark Tea Infuser.